Burkholderia sp. strain WSM2230 is a motile, non-sporulating, non-encapsulated, Gram-negative rod in the order Burkholderiales of the class Betaproteobacteria. The rod-shaped form varies in size with dimensions of 0.5 μm for width and 1.0-2.0 μm for length (Figure 1 Left and Center). It is fast growing, forming colonies within 1-2 days when grown on LB agar  devoid of NaCl and within 2-3 days when grown on half strength Lupin Agar (½LA) , tryptone-yeast extract agar (TY)  or a modified yeast-mannitol agar (YMA)  at 28°C. Colonies on ½LA are -opaque, slightly domed and moderately mucoid with smooth margins (Figure 1 Right). Burkholderia sp. WSM2230 can solubilize inorganic phosphate, produces hydroxymate-like siderophores, and can tolerate a pH range of 4.5 - 9.0 (Walker, unpublished). Minimum Information about the Genome Sequence (MIGS) is provided in Table 1. 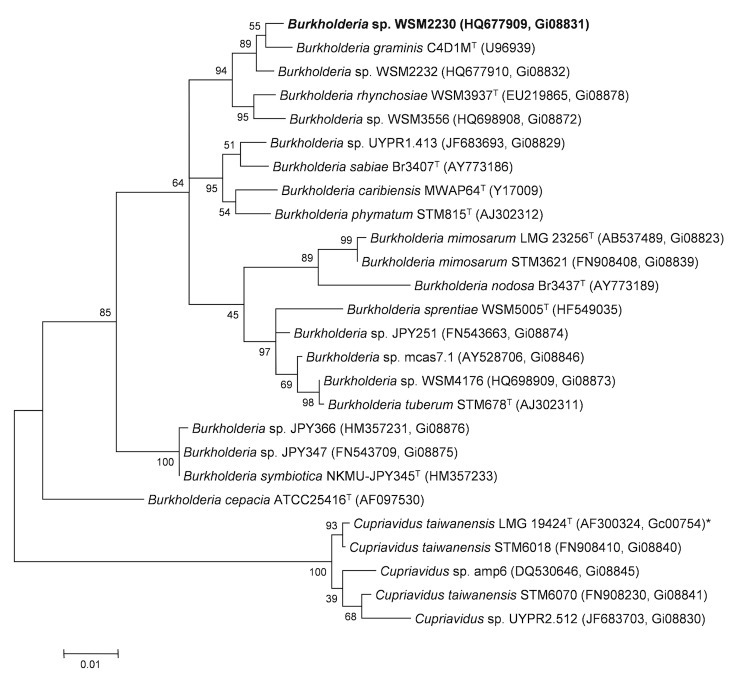 Figure 2 shows the phylogenetic neighborhood of Burkholderia sp. strain WSM2230 in a 16S rRNA sequence based tree. This strain shares 99% (1352/1364 bp) sequence identity to the 16S rRNA gene of the sequenced strain Burkholderia sp. WSM2232 (Gi08831). All general aspects of library construction and sequencing performed at the JGI can be found at the JGI user home . All raw Illumina sequence data was passed through DUK, a filtering program developed at JGI, which removes known Illumina sequencing and library preparation artifacts (Mingkun, L., Copeland, A. and Han, J., unpublished). The following steps were then performed for assembly: (1) filtered Illumina reads were assembled using Velvet  (version 1.1.04), (2) 1–3 Kbp simulated paired end reads were created from Velvet contigs using wgsim (Web Site), (3) Illumina reads were assembled with simulated read pairs using Allpaths–LG  (version r39750). Parameters for assembly steps were: 1) Velvet --v --s 51 --e 71 --i 2 --t 1 --f "-shortPaired -fastq $FASTQ" --o "-ins_length 250 -min_contig_lgth 500"), 2) wgsim (-e 0 -1 76 -2 76 -r 0 -R 0 -X 0), 3) Allpaths–LG (STD_1,project,assembly,fragment,1,200,35,,,inward,0,0 SIMREADS,project,assembly,jumping,1,,,3000,300,inward,0,0). Genes were identified using Prodigal  as part of the DOE-JGI annotation pipeline , followed by a round of manual curation using the JGI GenePrimp pipeline . The predicted CDSs were translated and used to search the National Center for Biotechnology Information (NCBI) non-redundant database, UniProt, TIGRFam, Pfam, PRIAM, KEGG, COG, and InterPro databases. The tRNAScanSE tool  was used to find tRNA genes, whereas ribosomal RNA genes were found by searches against models of the ribosomal RNA genes built from SILVA . Other non–coding RNAs such as the RNA components of the protein secretion complex and the RNase P were identified by searching the genome for the corresponding Rfam profiles using INFERNAL . Additional gene prediction analysis and manual functional annotation was performed within the Integrated Microbial Genomes (IMG-ER) platform [40,41].